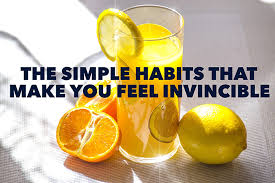 It’s sometimes the little things that make all the difference in forming healthy, productive, positive habits. Now, I don’t expect you to do all of these (nor do I do them all myself). But hopefully you find one or two (or more!) that enrich your experiences. The key to happiness is to appreciate what you already have (or so I say). So, instead of hitting the snooze button and going back to sleep, spend the first few minutes of your day expressing gratitude. Think about all the blessings in your life, big and small, that you tend to take for granted. This simple practice will help rewire your brain to think more optimistically every day. Basically, people aren’t perfect, so you shouldn’t expect them to act perfectly. Set your expectations straight every morning, and you’ll be frustrated a lot less during the day. Physical exercise isn’t just important for your health. Research has found that it’s also crucial in your brain’s ability to learn and grow (just read Spark: The Revolutionary New Science of Exercise and the Brain by John J. Ratey, a clinical professor of psychiatry). If you’re a busy person, it doesn’t have to take hours! I highly recommend the seven-minute workout. It’s challenging, but effective and extremely time-efficient. It’s crazy how many benefits this simple practice has. Among many other things, regular meditators experience less stress and anxiety, better sleep, sharper mental focus, and deeper relationships. Learn how to do basic mindfulness meditation—it’s well worth the time and effort. Decide on a particular set of habits you do every day that trigger moments of mindfulness. These could be, for example, doing the dishes, showering, or brushing your teeth. Allow yourself to be fully present during these activities. This is definitely challenging and uncomfortable, but the benefits speak for themselves. Cold showers burn fat, strengthen immunity and circulation, increase mood and alertness, and refine your hair and skin. Plus, it’s an excellent way to boost your mental toughness. Turn off your TV and computer, and put away newspapers and magazines. Then, eat your breakfast slowly and mindfully. Not only will your food taste better, but this also helps you absorb the nutrients better and makes it less likely that you’ll overeat. Repeat this cycle five times, and you’ll feel calmer in less than a minute. It’s that easy. Watching videos of cute animals can make you feel more relaxed in under a minute, says science. So, if you’re not a fan of breathing exercises, you can always watch one of these funny clips. If you’re serious about accomplishing your long-term goals, you can’t state them once a year and then forget about them—you need to remind yourself of the direction you want to go every day. You can turn your goals into brain tattoos by writing them down in a journal daily. Whenever you have an impulse to act on a goal, physically move within five seconds, as suggested in Mel Robbin, a television host and life coach’s, book, The Five Second Rule: Transform Your Life, Work, and Confidence With Everyday Courage. Introduce yourself, raise your hand, step into the cold shower, or do whatever else you need to do to get closer to your goal. And do it before your brain kills your good intentions with fear (as it usually does). This will help you prioritize what’s important and make you much more productive. Each morning (or the night before), choose three of your “most important tasks” you must accomplish during the day to consider it a success. Then, focus all your energy on these before doing anything else. This is the only exception to the rule above. If something takes less than two minutes, then do it immediately before moving on to other important things. Set aside a few minutes at the end of each week to reflect on your progress. Celebrate your successes, big or small, and think about what you can improve for the next week. If you want to be highly productive, you need to work for long stretches with deep, undisturbed focus. So, close the door, put your phone on “do not disturb” mode, turn off notifications on your computer, and block distracting websites before diving into your assignments. Then, once you’ve completed your deep work, you can use email as a reward. The email game will help you move quickly and decisively through each message—and actually have fun in the process. Seriously, sitting down all day is terrible for your health. Interrupt your sitting as much as possible. Set an alarm to remind you to get up and move around, and if possible, use a standing desk. Whenever you’re feeling nervous, strike a powerful posture by taking up space and exuding confidence, says social psychologist Amy Cuddy in her TED Talk about “power poses.” Doing this for just a couple of minutes will significantly increase your testosterone (“the dominance hormone”) while decreasing your levels of cortisol (“the stress hormone”). This will then help you calm down and feel more self-assured. Every time you walk through a door, straighten yourself up, smile, and hold your head high. By doing this, you’ll train yourself to enter rooms with a magnetic confidence, says author Brian M. in The Art of Charm. Human beings are wired for social connection and intimacy. Hugging releases hormones like oxytocin and dopamine that make us calm down and feel connected. So, choose a hug over a handshake (when appropriate, of course). Whenever you engage with other people, remember the three core behaviors of charisma: presence, power, and warmth, as stated in the book The Charisma Myth: How Anyone Can Master the Art and Science of Personal Magnetism. Be 100% engaged in the conversation, use powerful body language, and be genuinely concerned with helping the other person. In a world where almost everyone is constantly talking about themselves, people appreciate a good listener. If you want people to like you, more often than not, all you have to do is let them talk. Few things motivate people as much as being given credit for good work, says author and psychology professor Dan Ariely. Give credit where credit’s due. If your co-worker created an awesome presentation, send them a congratulatory email. If you listened to a helpful podcast, send a nice tweet to the host. It will encourage others to keep doing great work—and it will make you feel great, too. As says Don Miguel Ruiz in his book The Four Agreements: A Practical Guide to Personal Freedom, never say anything about someone that you wouldn’t say straight to their face. This is a great way to practice personal integrity. Pictures have the curious effect that they increase in value with time. A picture with your friends today might not seem that special, but 20 years from now, it’ll be a treasure. So, start building your visual autobiography today and take one picture every day. In a couple of years, you’ll be glad you did—and so will your friends and family. Eating something good? Say “yum.” Stretching out in bed? Say “ah.” Seriously—allow yourself to indulge in the small, daily miracles of your life and they’ll become much more pleasurable. Your words become your reality, so choose them wisely. Instead of saying “I can’t,” say “I won’t.” Instead of “I have to,” say “I’m going to.” Instead of “I don’t know,” say “I’ll figure it out.” Never speak of yourself as a victim, or else you’ll become one. At the end of your workday, take a few minutes to get any lingering tasks out of your head and down on paper, and schedule your most important stuff for the next day. Try to truly finish up so you can be completely present when you get home. Put your phone away when you’re at social gatherings—your relationships will benefit from it. Steal this tip from Brother David Steindl-Rast, a Benedictine monk, and take the time to soak in the small miracles of life. If you come across a beautiful night sky, a bird singing beautifully, or someone doing an act of kindness, let it touch you. Take a minute, or a couple of seconds if that’s all you have, to experience the moment fully before getting on with your day. We all know that when we feel happy, we smile. But, did you know that it works the other way around, too? When you smile, you tell your nervous system that you’re happy, and that makes you feel good. So, smile more, even when life gets tough. No matter what your day has been like, always tell your family, friends, or even cat about the best thing that happened that day as soon as you walk in the door. This is a powerful little habit, courtesy of one Quora commentator, that can transform the way you communicate with others and observe your own experiences. I used to loath housekeeping chores until I found this simple, scientifically-proven strategy. What you do is couple something you need to do with something you want to do. These days, I actually look forward to doing laundry (something I need to do) because it means I get to listen to an audiobook (something I want to do). Combine your chores with a reward, and they’ll become much easier to do. Spend just a couple of minutes a day getting rid of clutter. This could be physical clutter like clothes and stuff you never use, or digital clutter like icons and apps that are filling up your phone. Delete them, throw them out, or give them away. According to one Stoic philosophy, do something every day that makes you uncomfortable. Underdress (just a little bit) for cold weather, go without a meal, sleep without a pillow. You’ll get better at doing things you don’t want to do and that, as it happens, could be the key to success. I’ve found this to be very true in my life. The more people I help, the more opportunities come my way. Reach out and help someone every day. Lend a hand, send an email, answer a Quora question. The good intentions you put out will come back to you. Have it go off one hour before bed. When it rings, turn off all your screens and read a couple of pages in a book or meditate. Less technology time will help you sleep better. Whenever something awesome happens to you, big or small, write it down on a piece of paper and put it in a jar, says author and entrepreneur Tim Ferriss. Then, whenever you’re feeling down, open the jar and read your notes. You’ll feel so much better. Pre-commit to a particular behavior to engage in every time you start craving your bad habit. For example, each time you feel like eating something unhealthy, reach for a stick of gum or apple instead. Cravings usually only last a few minutes, so a “mini-action” can be all you need to overcome them. Finally, whenever you mess up, know that stacking guilt on top of it won’t make things better—it’ll only make it harder to bounce back. So, whenever you have a setback, treat yourself like you would a good friend—with compassion and reassurance.